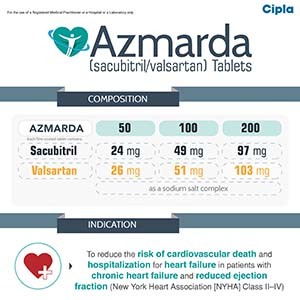 Azmarda is a brand of sacubitril/valsartan, the first-in-class angiotensin receptor neprilysin inhibitor (ARNI) presently approved for the treatment of heart failure with reduced ejection fraction (HFrEF). The brand card contains key information about this molecule on its composition, indication, dosage and administration, contraindications etc. in a reader-friendly format. Heart failure (HF) is the final step in different cardiovascular pathologies such as ischemic heart disease, hypertension and valvular heart disease. It is a major health problem associated with a significant morbidity and mortality not only in industrialized nations but also in the developing world. About 26 million adults worldwide are living with HF, leading some to describe it as a global pandemic. According to available estimates, around 17–45% of patients admitted to a hospital with HF die within 1 year of admission. Despite considerable advances in the medical treatment, rates of death and hospitalizations for HF remain high which also impose a considerable economic burden on patients. Thus, there is a great medical and fiscal need to develop newer strategies to improve survival as well as prevent hospitalizations and reduce readmissions. Sacubitril/valsartan is the first-in-class angiotensin receptor neprilysin inhibitor (ARNI) that contains the neprilysin inhibitor prodrug sacubitril and the angiotensin-II receptor antagonist valsartan in a salt complex (molar ratio 1:1). It offers simultaneous blockade of the enzyme neprilysin, and the renin angiotensin aldosterone system, subsequently resulting in vasodilation, natriuresis/diuresis, and decrease in myocardial fibrosis and hypertrophy. In the landmark Prospective Comparison of ARNI with ACE inhibitors (ACEi) to Determine Impact on Global Mortality and Morbidity in Hart Failure (PARADIGM-HF) trial – the largest ever clinical trial in HF till date, sacubitril/valsartan exhibited significantly greater reduction in cardiovascular death and HF hospitalization as compared to the angiotensin converting enzyme inhibitor (ACE-i), enalapril in patients with HF with reduced ejection fraction. It was well tolerated overall and did not exhibit any major safety concerns. The most common side effects which may be observed with sacubitril/valsartan are hypotension, hyperkalemia and renal dysfunction. AZMARDA exhibits the novel mechanism of action of an angiotensin receptor neprilysin inhibitor (ARNI) by simultaneously inhibiting neprilysin (neutral endopeptidase; NEP) via LBQ657, the active metabolite of the prodrug sacubitril, and by blocking the angiotensin II type-1 (AT1) receptor via valsartan. The complementary cardiovascular benefits and renal effects of AZMARDA in heart failure patients are attributed to the enhancement of peptides that are degraded by neprilysin, such as natriuretic peptides (NP), by LBQ657 and the simultaneous inhibition of the deleterious effects of angiotensin II by valsartan. NPs exert their effects by activating membrane-bound guanylyl cyclase-coupled receptors, resulting in increased concentrations of the second messenger cyclic guanosine monophosphate (cGMP), thereby promoting vasodilation, natriuresis and diuresis, increased glomerular filtration rate and renal blood flow, inhibition of renin and aldosterone release, reduction of sympathetic activity, and anti-hypertrophic and anti-fibrotic effects. Sustained activation of the renin-angiotensin-aldosterone system results in vasoconstriction, renal sodium and fluid retention, activation of cellular growth and proliferation, and subsequent maladaptive cardiovascular remodeling. Valsartan inhibits detrimental cardiovascular and renal effects of angiotensin II by selectively blocking the AT1 receptor, and also inhibits angiotensin II-dependent aldosterone release. The pharmacodynamic effects of AZMARDA were evaluated after single and multiple dose administrations in healthy subjects and in patients with heart failure, and are consistent with simultaneous neprilysin inhibition and renin angiotensin aldosterone system (RAAS) blockade. In a 7-day valsartan-controlled study in patients of heart failure with reduced ejection fraction (HFrEF), administration of AZMARDA resulted in a significant non-sustained increase in natriuresis, increased urine cGMP, and decreased plasma mid-regional pro-atrial natriuretic peptide (MR-proANP) and N-terminal pro b-type natriuretic peptide (NT-proBNP) compared to valsartan. In a 21-day study in HFrEF patients, AZMARDA significantly increased urine ANP and cGMP and plasma cGMP, and decreased plasma NT-proBNP, aldosterone and endothelin-1 compared to baseline. AZMARDA also blocked the AT1-receptor as evidenced by increased plasma renin activity and plasma renin concentrations. In the Prospective Comparison of ARNI With ACEI to Determine Impact on Global Mortality and Morbidity in Heart Failure (PARADIGM-HF) trial, AZMARDA decreased plasma NT-proBNP and increased plasma BNP and urine cGMP compared with enalapril. While BNP is a neprilysin substrate, NT-proBNP is not. Therefore, NT-proBNP (but not BNP) is a suitable biomarker for monitoring of heart failure patients treated with AZMARDA. In a thorough QTc clinical study in healthy male subjects, single doses of 400 mg and 1200 mg AZMARDA had no effect on cardiac repolarization. Neprilysin is one of multiple enzymes involved in the clearance of amyloid-β (Aβ) from the brain and cerebrospinal fluid (CSF). Administration of AZMARDA 400 mg once daily for 2 weeks to healthy subjects was associated with an increase in CSF Aβ 1-38 compared to placebo; there were no changes in concentrations of CSF Aβ 1-40 and 1-42. The clinical relevance of this finding is unknown. Following oral administration, AZMARDA dissociates into sacubitril, which is further metabolized to LBQ657, and valsartan, which reach peak plasma concentrations in 0.5 hours, 2 hours, and 1.5 hours, respectively. The oral absolute bioavailability of sacubitril and valsartan is estimated to be ≥ 60% and 23%, respectively. Following twice daily dosing of AZMARDA, steady state levels of sacubitril, LBQ657, and valsartan are reached in 3 days. At steady state, sacubitril and valsartan do not accumulate significantly, while LBQ657 accumulates by 1.6-fold. AZMARDA administration with food has no clinically significant impact on the systemic exposures of sacubitril, LBQ657 and valsartan. Although there is a decrease in exposure to valsartan when AZMARDA is administered with food, this decrease is not accompanied by a clinically significant reduction in the therapeutic effect. AZMARDA can therefore be administered with or without food. AZMARDA is highly bound to plasma proteins (94% - 97%). Based on the comparison of plasma and CSF exposures, LBQ657 does cross the blood brain barrier to a limited extent (0.28%). AZMARDA has an apparent volume of distribution ranging from 75L to 103 L.
Sacubitril is readily converted to LBQ657 by esterases; LBQ657 is not further metabolized to a significant extent. Valsartan is minimally metabolized, as only about 20% of the dose is recovered as metabolites. A hydroxyl metabolite has been identified in plasma at low concentrations (<10%). Since cytochrome (CY) P450 enzyme mediated metabolism of sacubitril and valsartan is minimal, co-administration with drugs that impact CYP450 enzymes is not expected to impact the pharmacokinetics. Following oral administration, 52 – 68% of sacubitril (primarily as LBQ657) and ~13% of valsartan and its metabolites are excreted in urine; 37-48% of sacubitril (primarily as LBQ657), and 86% of valsartan and its metabolites are excreted in feces. Sacubitril, LBQ657, and valsartan are eliminated from plasma with a mean elimination half-life (T1/2) of approximately 1.43 hours, 11.48 hours, and 9.90 hours, respectively. Geriatric: The exposures of LBQ657 and valsartan are increased in elderly subjects by 42% and 30%, respectively, compared to younger subjects. However, this is not associated with clinically relevant effects and therefore no dosage adjustment is necessary. Pediatric: AZMARDA has not been studied in pediatric patients. Gender: The pharmacokinetics of AZMARDA (sacubitril, LBQ657 and valsartan) are similar between male and female subjects. Race: The pharmacokinetics of AZMARDA (sacubitril, LBQ657 and valsartan) are comparable across different race and ethnic groups (Caucasians, Blacks, Asians, Japanese and others). Renal Impairment: A correlation was observed between renal function and systemic exposure to LBQ657, but not to valsartan. In patients with mild to moderate renal impairment (30 mL/min/1.73 m2 ≤ estimated glomerular filtration rate < 60 mL/min/1.73 m2) the AUC for LBQ657 was up to 2-fold higher. No dosage adjustment is required in patients with mild or moderate renal impairment. A 2.7-fold higher area under the curve (AUC) for LBQ657 was observed in patients with severe renal impairment (eGFR <30 mL/min/1.73 m2). A starting dose of 50 mg twice daily is recommended in patients with severe renal impairment. Caution is recommended when administering AZMARDA to these patients due to limited data. Hemodialysis: No studies have been performed in patients undergoing dialysis. However, LBQ657 and valsartan are highly bound to plasma protein and, therefore, unlikely to be effectively removed by dialysis. Hepatic Impairment: In patients with mild to moderate hepatic impairment, the exposures of sacubitril increased by 1.5- and 3.4- fold, LBQ657 increased by 1.5- and 1.9-fold, and valsartan increased by 1.2-fold and 2.1-fold, respectively, compared to matching healthy subjects. No dosage adjustment is recommended when administering AZMARDA to patients with mild hepatic impairment (Child-Pugh A classification) including patients with biliary obstructive disorders. A starting dose of 50 mg twice daily is recommended in patients with moderate hepatic impairment (Child-Pugh B classification). AZMARDA has not been studied in patients with severe hepatic impairment. Therefore, its use is not recommended in patients with severe hepatic impairment. AZMARDA is indicated to reduce the risk of cardiovascular death and hospitalization for heart failure in patients with chronic heart failure (New York Heart Association Class II-IV) and reduced ejection fraction. The target dose of AZMARDA is 200 mg twice daily. The recommended starting dose of AZMARDA is 100 mg twice daily. A starting dose of 50 mg twice daily is recommended for patients not currently taking an angiotensin-converting enzyme (ACE) inhibitor or an angiotensin II receptor blocker (ARB), and should be considered for patients previously taking low doses of these agents. The dose of AZMARDA should be doubled every 2-4 weeks to the target dose of 200 mg twice daily, as tolerated by the patient. Due to the potential risk of angioedema when used concomitantly with an ACE inhibitor, AZMARDA must not be started until 36 hours after discontinuing ACE inhibitor therapy. AZMARDA should not be co-administered with an ARB due to the angiotensin II receptor blocking activity of AZMARDA. AZMARDA may be administered with or without food. If patients experience tolerability issues (symptomatic hypotension, hyperkalemia, renal dysfunction), consideration should be given to adjustment of concomitant medications, or to temporary down–titration of AZMARDA. A starting dose of 50 mg twice daily is recommended in patients with severe renal impairment (eGFR <30 mL/min/1.73 m2). Caution is recommended when using AZMARDA in these patients due to limited data. No dose adjustment is required in patients with mild (eGFR 60-90 mL/min/1.73 m2) to moderate (eGFR 30-60 mL/min/1.73 m2) renal impairment. A starting dose of 50 mg twice daily is recommended for patients with moderate hepatic impairment (Child-Pugh B classification). No dose adjustment is required when administering AZMARDA to patients with mild hepatic impairment (Child-Pugh A classification). The safety and efficacy of AZMARDA in pediatric patients aged below 18 years has not been established. No dosage adjustment is required in patients over 65 years. Hypersensitivity to the active substance, sacubitril, valsartan, or to any of the excipients. Concomitant use with ACE inhibitors. AZMARDA must not be administered until 36 hours after discontinuing ACE inhibitor therapy. Known history of angioedema related to previous ACE inhibitor or ARB therapy. Concomitant use with aliskiren in patients with Type 2 diabetes. ACE inhibitors: The concomitant use of AZMARDA with ACE inhibitors is contraindicated, as the concomitant inhibition of NEP and ACE inhibitor therapy may increase the risk of angioedema. AZMARDA must not be started until 36 hours after taking the last dose of ACE inhibitor therapy. ACE inhibitor therapy must not be started until 36 hours after the last dose of AZMARDA. Aliskiren: The concomitant use of AZMARDA with aliskiren is contraindicated in patients with type 2 diabetes. AZMARDA should not be co-administered with an ARB due to the angiotensin II receptor blocking activity of AZMARDA. Concomitant use with aliskiren should be avoided in patients with renal impairment (eGFR < 60 mL/min/1.73 m2). Statins: In vitro data indicates that sacubitril inhibits OATP1B1 and OATP1B3 transporters. AZMARDA may therefore increase the systemic exposure of OATP1B1 and OATP1B3 substrates such as statins. Co-administration of AZMARDA increased the Cmax of atorvastatin and its metabolites by up to 2-fold and AUC by up to 1.3-fold. Therefore, caution should be exercised upon co-administration of AZMARDA with statins. Sildenafil: Addition of a single dose of sildenafil to AZMARDA at steady state in patients with hypertension was associated with greater BP reduction compared to administration of AZMARDA alone. Therefore, caution should be exercised when sildenafil or another PDE-5 inhibitor is initiated in patients treated with AZMARDA. Potassium: Concomitant use of potassium-sparing diuretics (e.g, triamterene, amiloride), mineralocorticoid antagonists (e.g. spironolactone, eplerenone), potassium supplements, or salt substitutes containing potassium may lead to increases in serum potassium, and to increases in serum creatinine. Monitoring of serum potassium is recommended if AZMARDA is co-administered with these agents. Non-Steroidal Anti-Inflammatory Agents (NSAIDs) including selective cyclooxygenase-2 inhibitors (COX-2 Inhibitors): In elderly patients, volume-depleted patients (including those on diuretic therapy), or patients with compromised renal function, concomitant use of AZMARDA and NSAIDs may lead to an increased risk of worsening of renal function. Therefore, monitoring of renal function is recommended when initiating or modifying the treatment in patients on AZMARDA who are taking NSAIDs concomitantly. Lithium: The potential for a drug interaction between AZMARDA and lithium has not been investigated. Reversible increases in serum lithium concentrations and toxicity have been reported during concomitant administration of lithium with ACE inhibitors or angiotensin II receptor antagonists. Therefore, careful monitoring of serum lithium levels is recommended during concomitant use with AZMARDA. If a diuretic is also used, the risk of lithium toxicity may be increased further. Transporters: The active metabolite of sacubitril (LBQ657), and valsartan are OATP1B1, OATP1B3 and OAT3 substrates; valsartan is also a MRP2 substrate. Therefore, co-administration of AZMARDA with inhibitors of OATP1B1, OATP1B3, OAT3 (e.g. rifampin, cyclosporine) or MRP2 (e.g. ritonavir) may increase the systemic exposure to LBQ657 or valsartan, respectively. Exercise appropriate care when initiating or ending concomitant treatment with such drugs. No clinically meaningful drug-drug interaction was observed upon co-administration of AZMARDA and furosemide, digoxin, warfarin, hydrochlorothiazide, amlodipine, metformin, omeprazole, carvedilol, intravenous nitroglycerin or a combination of levonorgestrel/ethinyl estradiol. No interaction is expected with atenolol, indomethacin, glyburide, or cimetidine. CYP 450 Interactions: In vitro metabolism studies indicate that the potential for CYP 450 -based drug interactions is low since there is limited metabolism of AZMARDA via the CYP450 enzymes. AZMARDA does not induce or inhibit CYP450 enzymes. AZMARDA must not be administered with an ACE inhibitor due to the risk of angioedema. AZMARDA must not be initiated until 36 hours after taking the last dose of ACE inhibitor therapy. If treatment with AZMARDA is stopped, ACE inhibitor therapy must not be initiated until 36 hours after the last dose of AZMARDA. Caution is required while co-administering AZMARDA with direct renin inhibitors such as aliskiren. AZMARDA must not be administered with aliskiren in patients with type 2 diabetes. Cases of symptomatic hypotension have been reported in patients treated with AZMARDA during clinical trials. If hypotension occurs, dose adjustment of diuretics, concomitant antihypertensive drugs, and treatment of other causes of hypotension (e.g. hypovolemia) should be considered. If hypotension persists despite such measures, the dosage of AZMARDA should be reduced or the product should be temporarily discontinued. Permanent discontinuation of therapy is usually not required. Symptomatic hypotension is more likely to occur if the patient has been volume-depleted, e.g., by diuretic therapy, dietary salt restriction, diarrhea or vomiting. Sodium and/or volume depletion should be corrected before starting treatment with AZMARDA. As for any drug that acts on the renin-angiotensin-aldosterone system, use of AZMARDA may be associated with an increased risk of hyperkalemia. In PARADIGM-HF, the incidence of clinically relevant hyperkalemia was low, resulting in treatment discontinuation in 0.26% of AZMARDA treated patients compared to 0.35% of enalapril treated patients. Medications known to raise potassium levels (e.g. potassium-sparing diuretics, potassium supplements) should be used with caution when co-administered with AZMARDA. If clinically significant hyperkalemia occurs, measures such as reducing dietary potassium, or adjusting the dose of concomitant medications should be considered. Monitoring of serum potassium is recommended especially in patients with risk factors such as severe renal impairment, diabetes mellitus, hypoaldosteronism or receiving a high potassium diet. Angioedema has been reported in patients treated with AZMARDA. If angioedema occurs, AZMARDA should be immediately discontinued and appropriate therapy and monitoring should be provided until complete and sustained resolution of signs and symptoms has occurred. AZMARDA must not be re-administered. In cases of confirmed angioedema where swelling has been confined to the face and lips, the condition has generally resolved without treatment, although antihistamines have been useful in relieving symptoms. Angioedema associated with laryngeal edema may be fatal. Where there is involvement of the tongue, glottis or larynx, likely to cause airway obstruction, appropriate therapy, e.g., subcutaneous epinephrine/adrenaline solution 1:1000 (0.3 mL to 0.5 mL) and/or measures necessary to ensure a patent airway, should be promptly administered. Patients with a prior history of angioedema were not studied. As they may be at higher risk for angioedema, caution is recommended if AZMARDA is used in these patients. AZMARDA must not be used in patients with a known history of angioedema related to previous ACE inhibitor or ARB therapy. Black patients may have increased susceptibility to develop angioedema. Similar to other drugs that affect the renin-angiotensin-aldosterone system, AZMARDA may increase blood urea and serum creatinine levels in patients with bilateral or unilateral renal artery stenosis. Caution is required in patients with renal artery stenosis and monitoring of renal function is recommended. As for any drug that acts on the renin-angiotensin-aldosterone system, use of AZMARDA may be associated with decreased renal function. In PARADIGM-HF, the incidence of clinically relevant renal impairment was low and associated treatment discontinuation was observed less frequently in patients receiving AZMARDA (0.65%) compared to enalapril (1.28%). Down titration of AZMARDA should be considered in patients who develop a clinically significant decrease in renal function. Caution should be exercised when administering AZMARDA in patients with severe renal impairment. No dosage adjustment is recommended when administering AZMARDA to patients with mild hepatic impairment (Child-Pugh A classification) including patients with biliary obstructive disorders. A starting dose of 50 mg twice daily is recommended in patients with moderate hepatic impairment (Child-Pugh B classification). AZMARDA has not been studied in patients with severe hepatic impairment. Therefore, its use is not recommended in patients with severe hepatic impairment. As for other drugs that also act directly on the RAAS, AZMARDA must not be used during pregnancy. AZMARDA exerts its effects via angiotensin II antagonism. As a result, a risk to the fetus cannot be excluded. There have been reports of injury to the developing fetus (e.g. spontaneous abortion, oligohydramnios and newborn renal dysfunction), when pregnant women have taken valsartan. Patients should be advised to discontinue AZMARDA as soon as pregnancies occur and to inform their physicians. It is not known whether AZMARDA is excreted in human milk. The components of AZMARDA, sacubitril and valsartan, were excreted in the milk of lactating rats. Because of the potential risk for adverse drug reactions in breastfed newborns/infants, AZMARDA is not recommended during breastfeeding. A decision should be made whether to abstain from breast-feeding or to discontinue AZMARDA while breast-feeding, taking into account the importance of AZMARDA to the mother. AZMARDA has not been studied in pediatric patients. The safety of AZMARDA in patients with chronic heart failure was evaluated in the pivotal phase 3 study PARADIGM-HF, which compared patients treated twice daily with AZMARDA 200 mg (n= 4,203) or enalapril 10 mg (n= 4,229). Patients randomized to AZMARDA received treatment for up to 4.3 years, with a median duration of exposure of 24 months; 3271 patients were treated for more than one year. Discontinuation of therapy due to an AE in the double-blind period of the PARADIGM-HF trial occurred in 450 (10.71%) of AZMARDA treated patients and 516 (12.20%) of patients receiving enalapril. The events most commonly associated with dosage adjustment or treatment interruption were hypotension, hyperkalemia and renal impairment. The overall incidence of adverse drug reactions (ADRs) of AZMARDA in heart failure patients was comparable to enalapril. The pattern of the ADRs is consistent with the pharmacology of AZMARDA and the patients underlying conditions. The overall frequency of adverse reactions was not related to gender, age, or race. Adverse drug reactions are ranked by System Organ Class and then by frequency with the most frequent first, using the following convention: very common (≥1/10); common (≥1/100 to <1/10); uncommon (≥1/1,000 to <1/100); rare (≥1/10,000 to <1/1,000); very rare (<1/10,000), including isolated reports. Within each frequency grouping, adverse reactions are ranked in order of decreasing seriousness (Table 1). Limited data are available with regards to overdosage in human subjects with AZMARDA. In healthy volunteers, a single dose of AZMARDA 1200 mg, and 900 mg multiple doses (14 days) have been studied and were well tolerated. Hypotension is the most likely symptom of overdosage due to the blood pressure lowering effects of AZMARDA. Symptomatic treatment should be provided. AZMARDA is unlikely to be removed by hemodialysis due to high protein binding. Do not store above 300C. Store in the original package in order to protect from moisture. If you experience any side effects, talk to your doctor or pharmacist or write to drugsafety@cipla.com. You can also report side effects directly via the national pharmacovigilance program of India by calling on 1800 180 3024.